My assignment tonight is to give you some of the history of this congregation as I have lived it, and to do that in a limited amount of time. One cannot fit very much into a limited amount of time, and I will do my best to stay as close to that limit as I can manage. So please be aware that between these lines there is a lot more history that I have not included –some of it humorous, and some of it serious. When I was born, the North Adams synagogue was the center of Jewish life in the northern half of Berkshire County. Thursday 10/24 at 7:30pm and Saturday 10/26 after services. In this two-part class, we’ll learn about Jewish death/dying traditions, the history and practice of the mourner’s kaddish and why our tradition historically requires a minyan for that prayer, how to co-create community and the importance of “showing up,” and more! On Thursday night (October 24) we will explore our community’s booklet Everlasting Life: A Guide to Jewish Death & Mourning Customs [pdf] and will learn about mourner’s kaddish and other prayers and practices relating to mourning. We’ll also learn a bit about shiva minyanim: what they are, how they work, why they matter. On Saturday morning (October 26), after reading the Torah portion Chayyei Sarah (which includes the death and burial of the matriarch Sarah), we’ll learn some of the traditions which come out of that Torah portion, and we’ll explore some texts relating to cemeteries, mourning, and caring for each other. We’ll also honor our chevra kadisha and cemetery committees during that Shabbat morning service. All are welcome; this class is free. Bring your questions about kaddish, minyan, death and dying! We look forward to exploring your questions, and some of our tradition’s answers, together. Today is a minor Jewish holiday which some of us may have never heard of. Today is Hoshanna Rabbah. Hoshanna Rabbah is the 7th day of Sukkot. The name means “The Great ‘Save Us! '” On this day, tradition calls us to circle seven times around our sanctuary with our lulavim (the bundles of branches which we’ve been shaking in the sukkah every day) and our Torah scrolls, while reciting prayers called Hoshanot which ask God to bring healing and salvation. (Here’s a bit of explanation about the Hoshanot.) Traditionally we would recite one Hoshana prayer each day of Sukkot, and today — the 7th day — we would recite all seven of them. After Hoshanna Rabbah comes Shemini Atzeret, “the pause of the 8th day.” (That begins tonight and flows into tomorrow; we’ll celebrate it with Yizkor services and beautiful prayers for rain tomorrow morning.) And then comes Simchat Torah, “rejoicing in the Torah,” which we’ll celebrate tomorrow night at 7:30pm at the Williams College Jewish Religious Center. Happy Hoshannah Rabbah to all! Join us this year for Chai Mitzvah learning! I’m writing in hopes that you will join me this year for an exciting new educational program called Chai Mitzvah. Chai Mitzvah was created in 2008 as a way to engage adults in a Jewish journey throughout their lives. The program features three elements: exploring a new (or new-to-you) Jewish ritual each month, doing some social action each month, and attending one Chai Mitzvah class at CBI each month. The Chai Mitzvah curriculum features lessons on subjects ranging from “Creating a New American Jewish Minhag/Custom” to “Tzedakah/Philanthropy” to “The Individual and the Community: What Are Our Responsibilities to Each Other?” It’s a terrific curriculum, assembled by a transdenominational group of educators; you can get a glimpse of it on the Chai Mitzvah website. Chai Mitzvah classes will meet at CBI once a month, on Saturdays, after Shabbat morning services. (Either we’ll make it a brown-bag lunch affair, or we’ll order in each time.) The class dates are 10/5, 11/2, 12/7 (2013); 1/4, 2/1, 3/1, 4/5, 5/3, 6/7 (2014). Classes are slated to run from 12:30-2pm, though we might shift that to be 12pm-1:30pm. For those who do not write on Shabbat, never fear — there will be no need to write things down. These classes count as Torah study, which is a wholly Shabbat-appropriate activity! For those whose Shabbat practice does include writing, you are welcome to bring your preferred note-taking materials if you like. We will all respect each others’ practices and choices. If you are interested in learning more, please contact Rabbi Rachel at 413-663-5830 or rebrachel@cbiweb.org. Tuition for the year is $18, which includes all curricular materials. If that’s not comfortable for you, please let the rabbi know privately. No one will be turned away for lack of funds. The first class meets on October 5, which is about ten days from now. Class size is limited — please sign up now! This Shabbat falls during chol ha-moed, the intermediate days in the midst of the festival of Sukkot. The appointed reading for today (Exodus 33:12–34:26) does make brief mention of Sukkot. Almost at the very end of the parsha we read “And you shall observe the feast of weeks, of the first-fruits of wheat harvest, and the feast of ingathering at the turn of the year.” The feast of weeks is Shavuot; the feast of ingathering is Sukkot. But mostly this parsha is about something different: a request from Moshe, and God’s intriguing answer. As some of our b’nei mitzvah students would be quick to remind me, God doesn’t “look like” anything — God doesn’t have a body — so what would it even mean to look upon God? It seems to me that the Torah here is speaking, as it so often does, in metaphor. First, Moshe asks “show me Your ways,” and God is happy to comply; in a sense, the entire Torah is God showing us God’s ways. But then Moshe asks to see God’s kavod, God’s glory. And God says, that’s not possible. Here is one reason why that might be. Much later in our history, the kabbalists would speak of God as ein-sof, “Without End.” God is infinite, limitless, vaster than our human minds can comprehend. Any human mind which actually expands far enough to encompass all that God is would…crack open, I think. Would be stretched beyond its limits. God is precisely that infinity which we can’t comprehend. 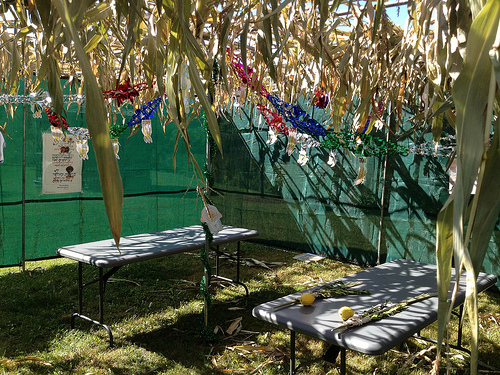 Our sages have asked: what is a sukkah? Some said: it’s a remembrance of the tents we lived in during the exodus from Egypt. Others said: it’s a reminder of the cloud of glory which traveled with us during the exodus from Egypt. Still others said: it’s a harvest house, a reminder of the temporary dwellings our agricultural ancestors used to build in their fields during harvest time. And still others said: it is temporary, beautiful, vulnerable, a place for welcoming guests and connecting with people (both those who are in our lives, and those ancestors whom we remember with love) — it is an embodied metaphor for human life. Like a sukkah, each life is temporary; each life is beautiful; each life is vulnerable; each life is enriched by the presence of our loved ones, both living and imagined. Into every life a little rain must fall, but we have the opportunity to greet even that rain with joy. In the sukkah, a house that is open to the world…the illusion of protection falls away, and suddenly we are flush with our life, feeling our life, following our life, doing its dance, one step after another. And when we speak of joy here, we are not speaking of fun. Joy is a deep release of the soul… Joy is any feeling fully felt, any experience we give our whole being to. Any moment in our life fully inhabited, any feeling fully felt, any immersion in the full depth of life, can be the source of deep joy. The commandment to rejoice in the sukkah isn’t telling us to “put on a happy face” — it’s an invitation to get out of our houses and be outside in this beautiful place where we live, to recognize that all of the structures we build around ourselves are ultimately temporary, and to find a profound joy in that. The seasons change: we can take joy in that. Our lives change: we can take joy in that. It’s harvest season: we can take joy in that. We’ve made it through the Days of Awe: we can take joy in that! Join us tonight for a vegetarian/dairy potluck in the sukkah at 5:30, and tomorrow morning for a Shabbat service which will feature music, teaching, some extra explanations, the psalms of Hallel, and a Torah study on Kohelet (a.k.a. Ecclesiastes, the scroll assigned to this festival.) Weather permitting, we’ll make our kiddush and study Torah in the sukkah. Wishing everyone moadim l’simcha, a joyous immersion in this festival of Sukkot, and Shabbat shalom, a sweet and joyous Shabbat! The festival of Sukkot begins on Wednesday evening at sundown, and lasts for a week. Thanks to those who came out on Sunday to build it once again, there is a beautiful sukkah at CBI. Bring lunch and come here on your lunch break — bring dinner — come with a thermos of hot tea or a bottle of wine in the evening and gaze at the moon — or just come and relax in the sukkah anytime you’re free. The primary mitzvah of Sukkot is to rejoice in the sukkah. Come and rejoice in ours! It is here for you, all through the holiday. 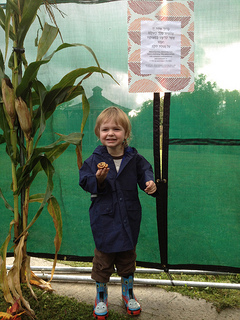 In short: come and use our sukkah! It is here for you.